Today, Lenovo unveiled a trio of exciting new multimode, convertible computers: the Yoga 2 Pro, the Flex 20 All-in-one, and the ThinkPad Yoga. All run Windows 8, and all twist and contort in ways that would make Nadia Comaneci very jealous. See, a multimode computer is a touchscreen laptop that you can orient in different ways by folding away the keyboard. There’s a tent mode, a tablet-esque flat mode, a stand mode, and just plain ol’ laptop. According to Lenovo, if you’re going to buy a laptop, you might as well buy one that’s also a tablet, right? The Flex 20 All-in-one convertible is a giant 19.5” (but slim!) computer positioned as a multi-person gaming device. I’m not talking World of Warcraft, though. The Flex 20 is more like an interactive gaming table, though of course you can stand it up like a normal computer. Lenovo even makes optional accessories for it should you choose to embrace its game table aesthetic: joysticks, air-hockey strikers, and e-dice. Monopoly will never be the same again. The Flex 20 All-in-one goes on sale later in September, starting at $899.99. 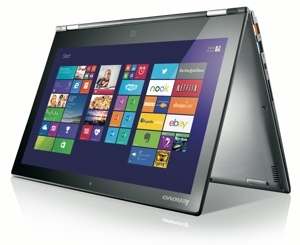 Lenovo’s 12.5” ThinkPad Yoga is oriented towards businesses. That means it’s a no-nonsense device with lots of options. If you need hard drive space, you can get up to 1TB of it. If you need faster performance, you can choose a smaller solid-state drive. You even get your choice of screen resolutions, up to 1,920 x 1,080. The ThinkPad Yoga seems like a great choice for a business with incredibly varied computing needs, but a relatively small budget. The ThinkPad Yoga hits store shelves in November, with prices starting at $949. Finally, we have the most powerful and impressive (at least to me) of the new Lenovo line, the 13.3” Yoga 2 Pro. Its 3,200 x 1,800, 10-finger touchscreen is more pixel dense than the MacBook Pro Retina; its 0.61 inch profile makes it thinner than a MacBook Air. And because it has 512GB worth of solid-state drive built in, you know the Yoga 2 will be quick to start. The Yoga 2 pro will be available this October in both gray and clementine orange. (I don’t pick the colors, I only report them.) It's competitively priced starting at $1,099.